The Sun Mountain Elite rain pants provide rain and wind protection. The pants feature breathability, which allows moisture vapor to be transmitted through the fabric; stretchable fabric that offers comfort and allows natural movement without restriction; moisture wicking that draws sweat away from the skin to keep it cool and dry for all day comfort and quick drying fabric that diminishes wet cling. 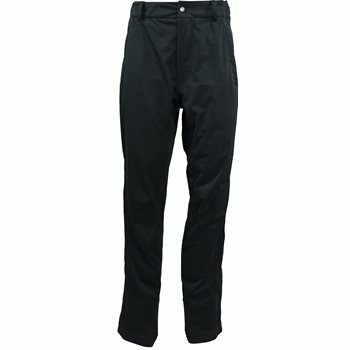 The Elite rain pants are designed with an auto-fit stretch waist with zipper fly and belt loops, two front pockets with zippered pass-through, a back pocket with Velcro closure, protective fabric overlay on the inside ankle, a snap system to shorten the pants, a cinch system at the cuff, deep lower leg zippers and knit fabric with three-layer construction that keeps you dry inside and out. Two year waterproof guarantee included.